The new Phantom 3 Standard, which is now available for purchase, features many of the same upgrades found in the rest of the Phantom 3 lineup, including a longer flight time of about 25 minutes, and a faster max speed of 16 meters per second. 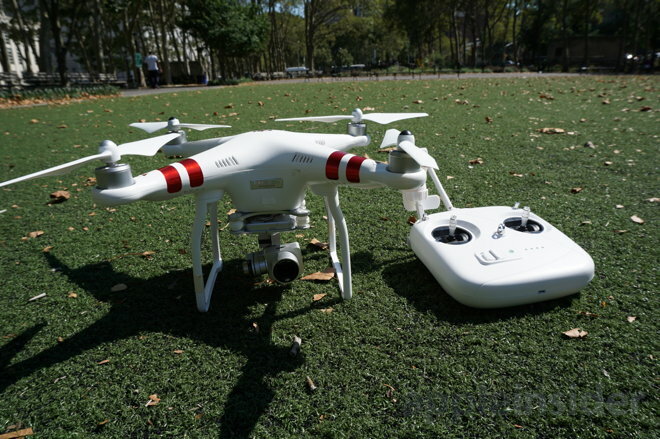 It also features the same proven design of the Phantom 3 series and its predecessors. The new low-end model achieves its entry price point with a lower-resolution camera than the Phantom 3 Advanced and Phantom 3 Professional. While the Professional model captures 4K video, and the Advanced version can record 1080p at 60 frames per second, the Standard is limited to 30 frames per second at 2.7K or 1080p resolutions. But the Phantom 3 Standard's integrated camera still includes a gimbal for super-smooth footage from the skies. 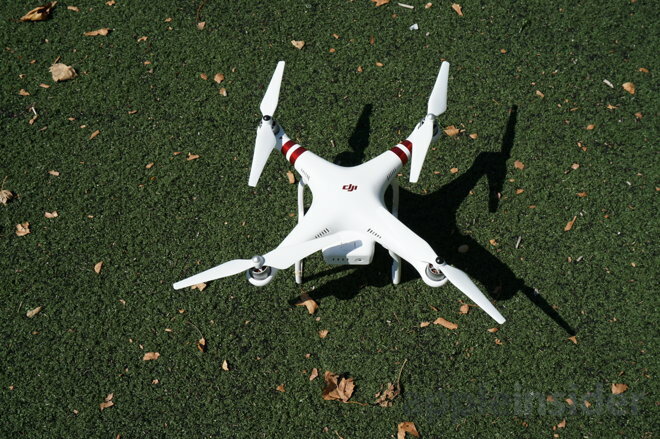 Essentially, it's the same camera rig found on the Phantom 2 Vision+ which was DJI's flagship model just one year ago. The integrated camera also captures 12-megapixel images with its 94-degree lens. Controlling the camera is accomplished through the connected iOS app. Like other models, the Phantom 3 Standard uses GPS to lock its position and can automatically return home in the event that a connection is lost. It also relies on the same "Intelligent Flight Batteries" utilized in the rest of the Phantom 3 series. 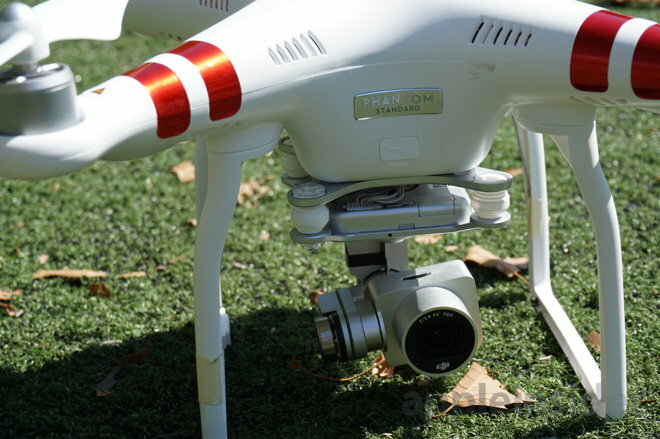 The Phantom 3 Standard also lacks the new and improved controller of the higher-end Professional and Advanced models. That means users must connect to the controller via Wi-Fi sharing, rather than with integrated support for Apple's Lightning connector. The controller also lacks the larger clamp found on the high-end controllers capable of holding a full-size iPad Air. The clamp on the Phantom 3 Standard is smaller, and adequate for holding an iPhone 6 series handset. DJI did upgrade the Phantom 3 Standard controller in one significant way over the Phantom 2 Vision+: It now includes an integrated, rechargeable battery, and no longer relies on replaceable AA batteries. The improved controller is recharged through a micro USB port on the bottom. Like all other Phantom models, the new Standard edition plays exceptionally well with Apple's iOS lineup, and streams 720p video at 30 frames per second live from the drone while in flight. It requires the new DJI Go app and a device running iOS 8.0 or later. Finally, while the higher-end Phantom 3 models include new sensors for indoor flight, the Standard edition does not have those capabilities. "Based on the remarkable success of the DJI Phantom 3 Professional and Phantom 3 Advanced, we wanted to create a new drone that addresses people who are curious about aerial imaging, but not quite ready to commit to a more professional system," said Frank Wang, DJI's CEO and Founder. "The Phantom 3 Standard makes it easy to get into the air to take great photos and videos." Customers can order the Phantom 3 Standard direct from DJI starting today. Orders are expected to begin shipping later this week.